A year or so ago, after an address I was giving to and for Quakers, during the question and answer period a woman asked me if I thought their Yearly Meeting would ever reach agreement on a new version of Faith and Practice. I said, "Tell me more" and she went on to explain that they had been struggling with coming up with a new version for a number of years and were not seemingly able to agree on a new edition. After hearing that, I said that I doubted that they would reach agreement unless they returned to an older model of Faith and Practice -- one that more resembled the 1967 Christian faith and practice in the experience of the Society of Friends of London Yearly Meeting than it does the Book of Discipline of the United Methodist Church or the Presbyterian Book of Order. The "old" Christian Faith and Practice is filled with, as the title implies, the experiences of Friends regarding important faith issues and their practice -- God, the Bible, worship, family life, and more. It is instructional in an illuminating -- not dictatorial -- way. But many books of Faith and Practice are becoming imitations of other Protestant denominations books of discipline -- which I think indicates that the creeping denominationalism has moved more into many of our Yearly Meetings becoming Protestant judicatories like synods or presbyteries or dioceses. According to one definition, a judicatory "is an administrative structure or organization found in a religious denominations between the local congregation and the ... [body] which is [a] higher court. ... the judicatory can have decisive authority over a local church, can offer standing for clergy members, ..."
I think this court language is especially dangerous -- especially in light of some things going on in certain largely programmed Yearly Meetings. I think it's dangerous because it shifts the emphasis from a focus on serving local congregations to the local congregations being subservient to and under the direction of the Yearly Meeting. And plays into the potential for power plays and an increasing disconnect between the Yearly Meetings and the local meetings. I am not advocating anarchy -- we Friends say we are about Gospel order. I agree. And there is much written in the Bible and other places about what that means and how to follow it. What I am against is a institutionalism that is dedicated to keeping institutions alive -- and to get rid of anyone (or meeting or group) that disagrees with the institutional hierarchy. Why do we have Yearly Meetings or other institutions? Does that need still exist? What are they doing that needs to continue to be done? Is there a better way of doing these things? Further, I think these larger institutions and their staff and constituencies need to look at every program and staff position and ask the question "How does this fit with our mission -- our raison d'être?" We shouldnt' be asking "Is it good or worthy?" Many programs and staff people may be good and worthy, but they may also detract from the institution's primary purposes. In which case the organization then does not do the ministry for which it was created. I fear we spend too much time staffing boards and committees that may no longer be needed -- simply because Faith and Practice tells us that we need X number of representatives from each Meeting, Quarterly Meeting or whatever to serve on such and such a board. And we hear reports and do some business and rarely ask, "Is this what God is calling us to at this time?" Why do we exist -- what's our mission? What is God calling us to be and do? How do we relate to our constituency? Are we willing to adapt to change? These questions seem vital to me -- especially if our larger institutions want to become or remain vital. The questions need to be asked regularly. They can't be answered once and for all time. If the organizations don't ask these questions -- and engage the people served by them in a discussion of the questions -- the organizations, no matter how worthy or long-lived up until now, will become increasingly anachronistic. They will then either die or be replaced by new organizations that spring up to meet the needs they are not fulfilling. Organizations that are mission driven, leaner, think faster on their feet, and adapt to the needs of the people and organizations that created them. That's one way to look at how early Quakerism came into being. As a fresh way to communicate a Gospel that had been boxed in by institutionalism, rites, rituals, clergy, and books. Fox and the early Friends sprung up in reaction to and against that. What would they think of us today? Part of me reads this and also says "amen," but the other responds "oh no." So the "amen": Yes we have too many narrow-interest committees that aren't creative or dynamic. Yes, a lot of the institutional work is almost guilt-ridden--we have quarterly meetings because we're supposed to have quarterly meetings, etc., etc. But I think "oh no" when I imagine actually having these conversations in a large forum. I was actually in one a few weeks ago and it wasn't at all productive. A big part of the problem is we've forgotten why we're doing all this. We've split the faith from the practice--and I don't mean Christian vs non-Christian, but the whole kit-and-kaboodle that is the Quaker understanding of gospel order, a world view that is distinct from that of other Christian denominations. This is what undergirds our institutional structures. But when we don't have a good grasp of it, we do things because we're supposed to and the process feels dry and spirit-less. In practice, when we ask "what is x for?" a lot of Friends answer "Nothing! let's get rid of it!" That's part of the negative feedback loop that's getting us in trouble. As an example, about seven years ago my quarterly meeting went through a naval-gazing process. I tried to be involved, as did my then-Quaker wife. We asked a lot of big questions but the others just wanted to ask small questions. When we asked about divine guidance at sessions, for example, one fellow condescendingly explained that if we spent all our time asking what God wanted we'd never get anything done. How am I supposed to respond to that? One thing they were complaining about was that it was always the same few people doing anything but after a few rounds of those meetings, we ran screaming away (my wife right out of the RSoF altogether). Re-visioning isn't just deconstructing institutions we don't understand or tinkering with some new process to fix the old process that doesn't work. If you've got a group of people actively listening to the guidance of the Inward Christ then any process or structure can be made to work. I know you know all this, Brent. I just don't see Friends near me ready to ask the big questions that are necessary if we're going to undercover the living rationales for our community structures. "What I am against is a institutionalism that is dedicated to keeping institutions alive -- and to get rid of anyone (or meeting or group) that disagrees with the institutional hierarchy." "I fear we spend too much time staffing boards and committees that may no longer be needed -- simply because Faith and Practice tells us that we need X number of representatives from each Meeting, Quarterly Meeting or whatever to serve on such and such a board. And we hear reports and do some business and rarely ask, "Is this what God is calling us to at this time?" AMEN! On a few occasions I have dared to suggest something that was counter to Faith and Practice, but not anti-biblicall, and was shot down because it wasn't in line with what Faith and Practice says. I also find that most people read it like they read their Bibles--for prooftexting purposes. Most could not tell you what it says, but let their pet issue be at stake and they'll quote you section and page number of what Faith and Practice says. Many people feel it must be taken literally and they leave no room for interpretation and consideration of what would work best in their individual contexts. There is one function of yearly meetings that seems to get overlooked a lot. They are times when we experience a lot of gifts being exercised by various Friends. It is especially helpful when the Lord uses someone else's exercise to teach us how to exercise our own individual gifts better, so that we grow in our gift even if we don't express it during YM week. Perhaps if we did more waiting in worship that rather than trying to "move things forward", and cared about each other (and the world) more than our institutions, we'd do better. Preserving institutions at any level becomes questionable in terms of "right use" of time. If a monthly meeting struggles to attract new members -- might it be because we're too dour? And if we plow up the same ground continually, nothing has a chance of bearing fruit. Doesn't mean we shouldn't tend the garden... Just means that plowing has its season. Having the ground lay fallow is a good thing from time to time. Why do we fear this? I'm pulling back from work at yearly meeting level in order to be faithful in the day of small things outside Quaker circles and the positive activities within the Quarter of which I'm a part. What we do is who we are -- If we spend the time in waiting worship, a vibrant faith and practice may result and at least we are willing to become changed ourselves, to paraphrase William Penn. The rest will follow. This summer, my very strong leading at yearly meeting sessions in Allentown was to dis-engage -in the midst of a presentation of something about which I'm passionate -- ecology/economy/justice. Would I do better in a secular sphere? In New England YM a week later, this sense was reaffirmed in the depths of waiting worship. I felt in the right place, to support those struggling to listen for the still small voice and striving to make love the first motion. Ah, I understand completely, Martin -- and yet I think it is time to have the "oh no" feeling and proceed with the conversation. I agree that we've got the separation you've outlined and it is time to try to heal that rift. We need faith + practice -- and an understanding of both. And if our current structures cannot do it (and cause people to run screaming from us -- which does not surprise me (but alarms me)), then it is time to move out of them, I think. If they cannot be reformed, perhaps it is time for re-forming. Or at least forming new alliances/organization that meet the needs and marry faith and practice. In some ways, I think that is why groups such as Friends General Conference, Friends United Meeting, and Evangelical Friends Internation came into being. There was a need and something new was born. The same is true for Earlham School of Religion and Friends World Committee -- and countless other groups. It is, I think, the nature of institutions that they become frozen in their ways -- no matter how well intentioned they are. And sometimes they need to be superseded with something fresh and new that allows room for the Spirit to move. I think we are at that time -- and so much risk having the conversations. And I want to make it clear that I am not just talking about Yearly Meetings. 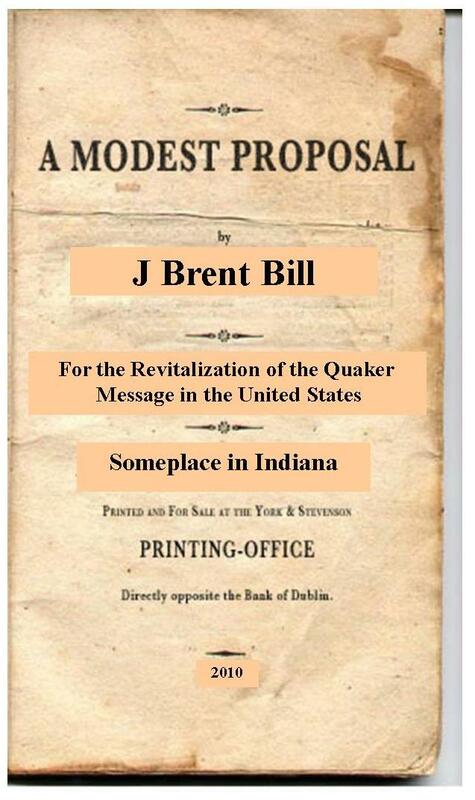 I am talkign about all Friends organizations -- if we want to revitalize the Quaker message. This includes groups like FUM & FGC, FWCC, our seminaries and colleges, and so on. Perhaps it is an impossible task -- but I hope that at least some of our groups and people will say, the time has come. What is God calling us to do? I am tired of God being used as a political and personal bludgeon. I am weary of God and Jesus and Christianity and church and scripture being used in the service of or as an excuse for or a justification for: death, war, murder, destruction, violence, oppression, condemnation, retribution, vengeance, hate, fear, slavery, systemic injustice, oppression, condemnation, retribution, exclusion, segregation, discrimination, sectarianism and censorship. There is no spiritual validity to worshipping God as though God were a narcissistic Greco-Roman pagan deity or as a nationalistic cheerleader and protector. It has been 493 years since Martin Luther posted his Thesis on the door of Wittenberg Cathedral. It is time – long past time – for a posting of another thesis. On Sunday, October 31, 2010, the Second Reformation will begin. On the 493rd anniversary of the first reformation, God and Jesus and church and the Good News and Christian theology will be reclaimed. Hope will replace fear. Love will replace hate. Universal inclusion will replace exclusion. Justice as healing and rehabilitation and restoration will replace abandonment and abuse and obliteration. A God of unqualified grace and unrestrained love will be restored. At the bottom of that article, there are links to six (6) other relevant articles. I've been working with a group in New York Yearly Meeting that s wrestling with just these questions, precipitated by a failure to approve the budget at Summer Sessions 2010. Because NYYM is so vast geographically and diverse culturally (eg. both programmed and unprogrammed meetings), and because its key institutions are all on the Hudson River corridor—YM summer sessions on Lake George, office in Manhattan, conference center near Albany—many of the western meetings especially, feel they are being taxed without representation and getting lousy customer service besides. This group is at least the third since the late 1980s to try to solve the problem of disconnect between YM and local meetings. As I see it the basic problem is that the YM organization (it's sessions, staff and committees) do the business of the YM committees and not the business that serves the local meetings and their membership. I did a statistical analysis of the minutes for the year 2002 once and only roughly 5% of the substantive business done that year had anything to do with local meetings, and only one, maybe two (it wasn't clear from the minute) came to the YM through traditional gospel order from a local meeting. The solution has always been more "outreach" to the local meetings, attempts to tell them what the YM is up to, get input from them about priorities, get more local Friends involved in YM committees and affairs. Totally missing the point of their complaints with more top-down efforts, rather than — what? Here's the problem: Because our regional meetings are almost al moribund and incapable of doing the business of service, nurture and oversight of local meetings, "power" has naturally anti-gravitated to the YM. Well, this post is getting too long. I've been thinking about it way too much, several essays worth. My short response to what yearly meetings are for is to do the business that properly belongs at that level: dealing with other macro-organizations, centralized administrative and staff service functions, like dedicated funds and response to inquiries about Friends, and sessions. No committees organized around a concern—standing committees subvert the traditional faith and practice of Quaker ministry. And a less-well-defined role of consultation, nurture and exploration, since yearly meetings always have one thing local meetings don't—a critical mass of seasoned Friends with extraordinary gifts. I think Steve Davison is on the right track. There used to be Genesee YM in western New York; maybe it's time for it to rise again. I'm pleased that NYYM didn't approve a budget; maybe there will be some progress now. In this effort, I take my stand with the church model embodied in the ancient Israelite "amphictyony" or tribal league (more on this here: http://quaker.org/quest/issue4-3-1.html ). I realize that "amphictyony" is one of the top ten clumsiest bits of religious jargon that's ever tripped, stumbled and staggered across my tongue; but it's worth a look all the same. And anyway there's a more current image for it that's much easier to grasp: The "Quaker-wide-web." Amphictyonys are flat, non-hierarchical. Kings and bishops hate them; but the Biblical God liked them just fine. This "amphictyony" preference is also why I'm totally with you, Brent, on the London/Britain model for Disciplines/F&Ps over the denominational handbook approach. The latter, in my view, is hardly more than a cookbook full of recipes for trouble. And on the other hand came the recurrent murmur of the underpaid and job-insecure pastors, which is most of them, that such "clarity of mission" is how the megachurches do it, with their big crowds and big staffs with big salaries, and so whatever it takes . . .
What can come of this mishmash? Well, with God all things are possible; but the elephants I saw tramping mainly unacknowledged around the room were not much affected by it all. So for my two pence, give me a F&P that collects samples of what is deemed the best (i.e., most Light-reflecting) wisdom of past and recent present, and let us work with it to solve our own problems, at the most suitable level where something gets done. I'm also with Seth (Chronicler) that the annual session is a time to soak up the gifts of other Friends. I know I'm a better Quaker because of going to Yearly and Quarterly Meetings for the last 10 years (thanks to Robin, who first got us to go). PacYM has also increased the amount of worship time at the annual session, which has been helpful in deepening the time together. College Park Quarterly Meeting has also become much more intentional in the last five or seven years about using the time together to deepen our spiritual understanding and roots. Like Chris, I am a better Quaker for having spent a week each year for the last ten years at PacYM. However, I think that the conversations about the role of PacYM have not been especially fruitful, at least not yet. A lot of talking, yes, and a lot of work by a few people, but for most Friends in PacYM, the Yearly Meeting is still pretty irrelevant. I'm not sure at this point what would really make a difference.